M2 surged in July and August, as investors and asset managers sought the relative safety and liquidity of bank deposits and other assets that make up the M2 aggregate. Notably, institutional investors, concerned about exposures of money funds to European financial institutions, shifted from prime money funds to bank deposits, and money fund managers accumulated sizable bank deposits in anticipation of potentially large redemptions by investors. In addition, retail investors evidently placed redemptions from equity and bond mutual funds into bank deposits and retail money market funds. 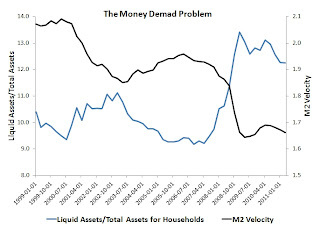 In other words, we have rapid growth in M2 coming from a surge in money demand. This is a big deal, because money is the one asset on every market and an increased demand for it will thus affect every other market. 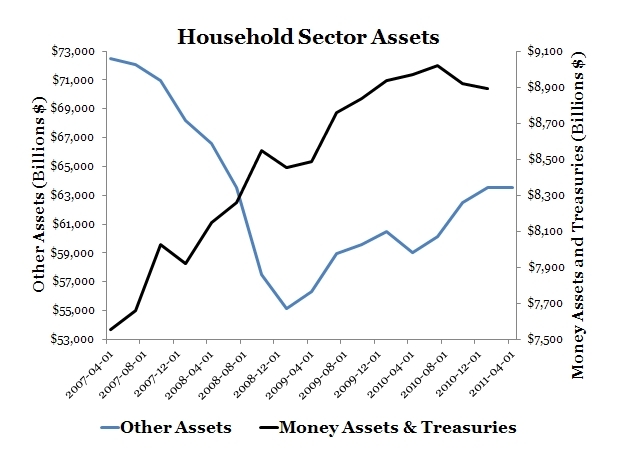 The more money demand there is, the less nominal spending there will be on goods, services, and other assets. This development means the economic slump is being prolonged. It is great to see the Fed acknowledge this problem, but the fact is this problem has been going on for the past three years and the Fed has failed to address it in a forceful and systematic manner. All the Fed’s interventions over the past three years, including Operation Twist from this meeting, have not arrested this problem. How do we know this? Well, start with the figure below. 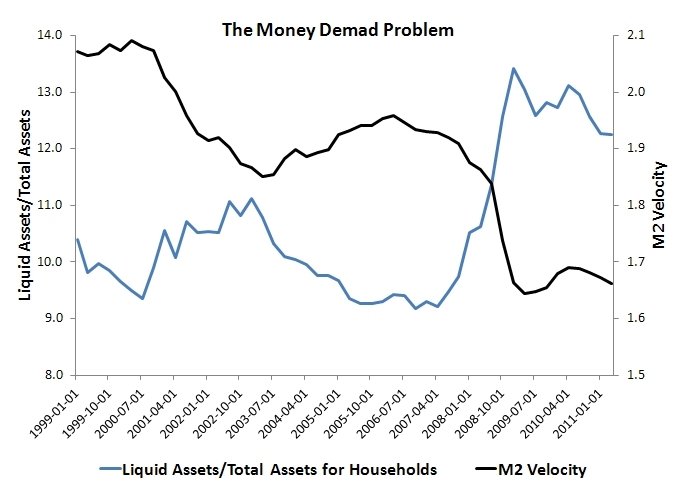 It shows that the share of household’s liquid assets (cash, checking account, time and saving deposits, money market accounts, and treasury securities) as a percent of all household’s assets is closely tied to the swings in M2 velocity. Note that household’s share of liquid assets never has returned to its pre-crisis level. 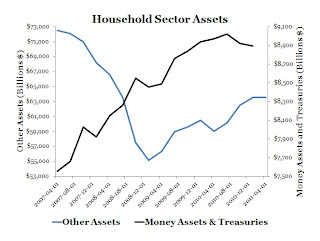 Due to the ongoing economic uncertainty, households still have an elevated demand for these assets and consequently money spending has fallen. Consequently, velocity too has yet to return to its pre-crisis level. 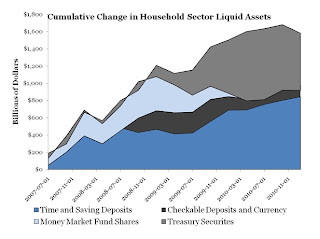 The composition of the increase in liquid assets is also interesting as seen in the next figure. 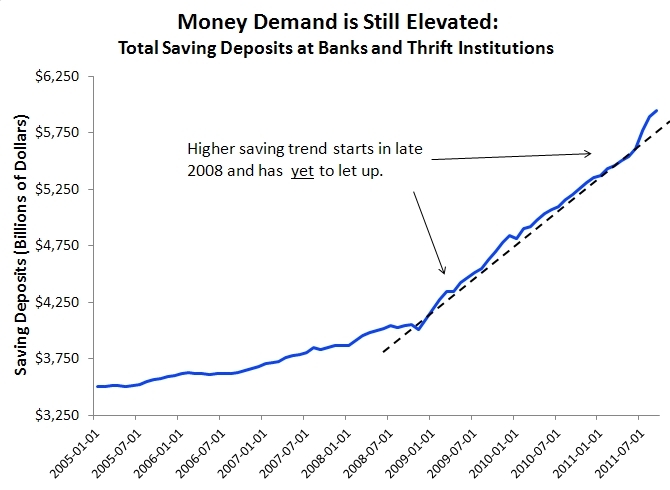 Most of the increase has come in the form of time and saving deposits, though treasuries have been important too. 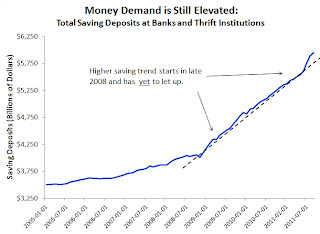 Money assets alone (cash, checking account, time and saving deposits, and money market accounts) have remained elevated and close to their peak value in late 2008. 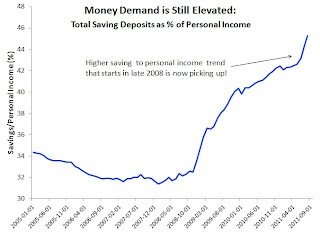 This last figures shows us that the growth in savings is clearly not an increase in money demand from income growth. It is all about holding precautionary money balances. 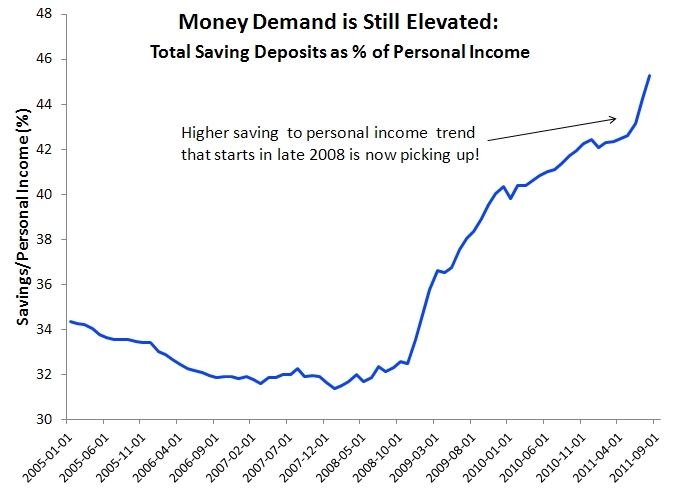 And this is why nominal spending continues to slump. So what can be done? My own view is that the money demand problem could be fixed by properly shaping expectations about future spending and inflation via something like a nominal GDP level target. Unfortunately, the latest FOMC minutes indicate that is not an option. So for now we lumber on, hoping that in absence of forceful and systematic Fed actions the market will be able to heal itself in a timely fashion. 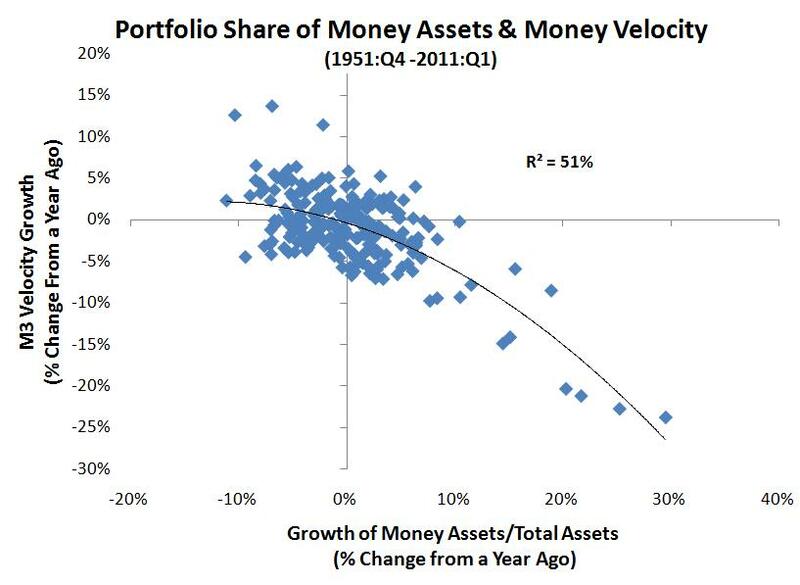 Update: This figure from a previous post shows that share of liquid assets has been systematically related money velocity over the past 60 years or so. This post originally appeared on Macro and Other Market Musings and is reproduced here with permission.